Learn How to Build an Outdoor Sofa and Coffee Table | Wood. It's Real. | Wood. It's Real. 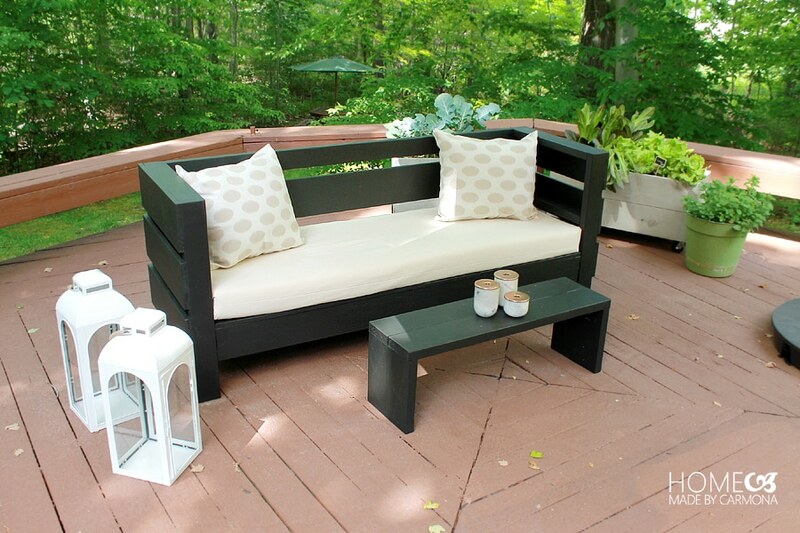 Here’s what we like about these plans for an outdoor sofa and coffee table from HomemadeByCarmona.com. DIYer Ursula Carmona used pressure treated Southern Yellow Pine for the project. That’s because pressure treated SYP can be painted and stained to look great, and will also last a long time outside. These plans look totally do-able. There’s no crazy cuts or advanced woodworking skills required. The sizes and lengths of lumber she used are readily available at any big box store or lumber yard (a few 2×4’s, 2×6’s, 1×6’s and 1×8’s). There’s a hidden little drink shelf inside of the armrest. How clever is that? This project also looks affordable to complete and will be strong enough to handle many hours of lounging. That’s because Southern Yellow Pine is affordable, strong, and durable. What do you think? Does this look like a plan for your Pinterest? Choices, Choices: What Type of Wood Do I Need?